Firebird is home to the FCB, which is a non-profit performing group of children and adults dedicated to bringing the joy of the arts into the lives of children through performance and outreach opportunities. In furthering our mission, at least one show of every production is offered to children or those with special developmental needs all at a reduced rate. Wonderland~A Christmas Special, Hansel & Gretel, Red Riding Hood, Jack & the Beanstalk, and Coppelia, with the NUTCRACKER coming in December! Want to Join? The FCB is free and is open to all through audition. It's really that simple to be part of this amazing group. Click the drop down tab on this page for more info. on fundraising activities. What a Success! We are already planning for 2014! 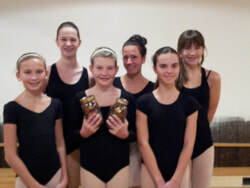 Grace holding money jars with fellow PASEers! Firebird has given FCB a free life-long lease to the 3rd floor for rehearsal purposes. However, due to fire code regulation, we are unable to use this beautiful space until we install an approved fire escape ladder costing $6,850.00. We currently have raised $762.48 with nearly half of that was donated by Firebird student Grace Baldwin, who did odd jobs to earn $341.48! Way to GO GRACE! 11-27-13 balance is $1,256.00 :) Update: Bal. as of 2/2014 $1,362.03!!! Want to make a DONATION? Just call the studio and we can help you place 100% of your donation toward the Ladder! No funds have been reported through go fund me which is An online account has been created at www.gofundme.com/3m6u40. It is a quick and easy way to help! Please note: GoFundMe retains 10% for administrative purposes. If you want 100% to go to our cause, you must go through the studio.